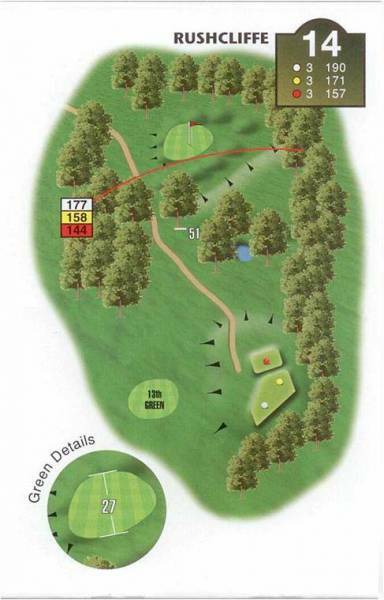 "The Rushcliffe 'signature' hole is the best of the par 3s, offering an elevated tee shot measuring 206 yards off the very back. Large statesman-like trees stand guard over this charming and challenging hole. A sheltered tee seduces you into ignoring the wind direction, but once the ball rises above the treetops the wind will take control. The green is larger than average but offers one of the most difficult putts on the course. Whatever you do, you can enjoy the array of bluebells and pheasants that gather in this most serene corner of the course."